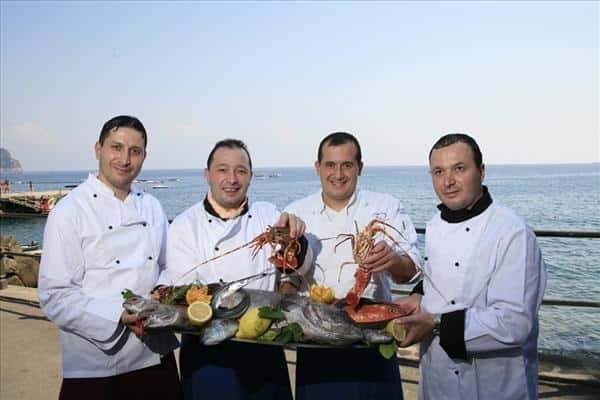 If you are planning a holiday on the Amalfi coast you absolutely cannot miss a stop at "L'Arsenale" Restaurant run by the family Proto. Their cooking exalts the tastes of the area, reinventing traditional dishes of the region and using only fresh and high-quality ingredients. There is also a daily choice for fish. As suggested by Daniele, one of the owners, we pre-booked a table (the restaurant is crowded during the summer) and ordered a mixed appetizer and "pappardelle con cicala di mare" (pappardelle pasta with mantis crab). The appetizer consisted of various tastes: "calamaretti con crema di zucchini e crostini di pane" - small squid with courgette cream and toasted bread - (very delicate), "tortino di melanzane con acciughe e capperi e fiore di zucca ripieno" - aubergine cake with anchovies and caper and stuffed courgette flower - (an exaltation of the products in season and the stuffed courgette flower was a real symphony), "tartara di tonno crudo" - minced raw tuna fish with seasoning - (the freshness of the ingredients is essential in this case and although the early reluctance because we are not accustomed to have raw fish, it was a very delicious dish!) and "totano ripieno, alici fritte ripiene, calamari e patate e parmigiana di pesce" - stuffed squid, stuffed fried anchovies, squids and potatoes and fish parmigiana - (this is a mix of the most famous courses of sea traditional kitchen). The first course was quite large, al dente cooked and not very rich in order to exalt the shellfish freshness: the flesh of the mantis crab was soft and meaty! To drink, Gewurztraminer Alto Adige DOC 2005 "Elena Walch" white wine. While we were waiting for the dessert (a chocolate cake and torrone ice-cream mousse) we were served some "cantuccini" biscuits and a glass of "Barolo chinato". We spent a wonderful evening; L'Arsenale Restaurant is the ideal place for those who want to taste high-quality food sparing no expense. Only a suggestion: try to visit the restaurant during the law season if you do not want to pre-book or to queue for the next available table.